A recording of the late American astronomer Carl Sagan explaining the cosmos has become the first vinyl record played in space. 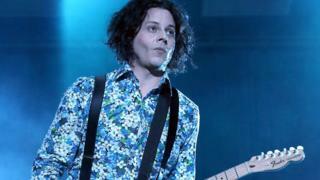 The disc was launched on a weather balloon by rock musician Jack White as part of seventh anniversary celebrations for his record label. It reached a height of 94,413 feet (28,000 metres) before the balloon burst and it plummeted back to earth. In a statement, White said it was an "exhilarating" achievement. "It brings us great fulfilment to pay tribute to the incredible scientist and dreamer that Carl Sagan was," he said. Sagan's speech - which includes the famous lines: "The sky calls to us. If we do not destroy ourselves we will one day venture to the stars," - was previously issued on 7-inch vinyl by White's Third Man Records. Special equipment had to be designed to make sure the record could spin under the extreme conditions of a journey out of earth's atmosphere. The Icarus Craft was designed and engineered by Kevin Carrico, who said it was not just turbulence that could upset the turntable's ability to play. "As you rise higher and higher into the thinning atmosphere, temperature and increasing vacuum can cause issues," he said. "Vinyl has a rather low melting point (160F / 77C) and, without air to keep things cool, you could wind up with a lump of melted plastic... so our turntable platter also served as a heat-sink in order to keep the vinyl cool in direct sunlight." The record was also plated in gold to prevent the grooves from losing their shape. Thanks to those precautions, the mission was a success - and the turntable was still spinning when it was recovered in a vineyard on Saturday morning. "Our main goal from inception to completion of this project was to inject imagination and inspiration into the daily discourse of music and vinyl lovers," said White. "Combining our creative impulses with those of discovery and science is our passion, and even on the scale that we are working with here, it was exhilarating to decide to do something that hasn't been done before and to work towards its completion." You can watch a video of the entire 80-minute flight on the Third Man website.